This is a fascinating and whimsical 1940s manuscript map of Brookhaven and Smithtown located in Suffolk County, NY. 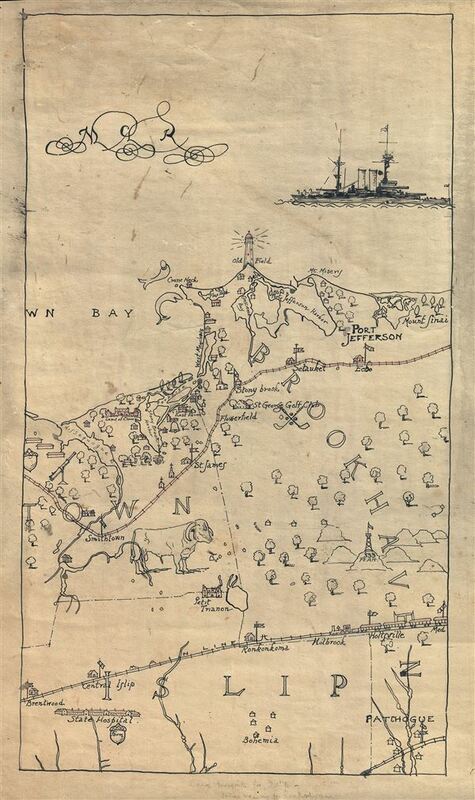 The map covers the northern shore of Long Island from Mount Sinai to Nissequogue River and south as far as Bohemia in Patchogue. The areas of Brentwood, Central Islip, Ronkonkoma, Smithtown, Holbrook, Holtsville, St. James, Port Jefferson, Setauket and Medford are included. The map is exceptionally detailed and accurate with relief shown with trees and mountains in profile throughout. The route of the Long Island Rail Road is noted with beautifully illustrated stations along with an illustration of a train. An impressive illustration of a battleship is included in the top right quadrant of the map. The map identifies the St. George Golf Club, which built in 1917, still exists today. Although not named, the map notes Telescope Hill, the highest point in the town of Brookhaven, with a fire lookout tower. The height of the hill, which is 334 ft. is here marked as 333 ft. Just north of Ronkonkoma station, the map notes a small lake (Lake Ronkonkoma) and 'Petit Trianon.' Petit Trianon was an inn which stood on the southwest shore of Lake Ronkonkoma from 1911 to 1957. Built to entertain the Vanderbilt Family guests at the end of the Long Island Motor Parkway, the inn burned down in 1957. The top left quadrant of the map contains the initials N.C.R. in beautiful calligraphy, most probably referring to the creator of the map. Overall a fascinating depiction of the region during the 1940s. Very good. Backed with linen. Minor overall toning. Contains notes written in pencil along bottom and right margins, can be easily erased. Some spotting and smudging at places.